Universal theory is an alternative to Regularity theory, and offers a different definition of physical law. You should read the Regularity post before this one. I have learnt about the theory as posited by the philosopher D M Armstrong, but it has also been proposed (in slightly different forms) by Fred Dretske and Michael Tooley. For this reason, some people call it the Dretske-Tooley-Armstrong theory. This theory uses a lot more heavy philosophical machinery than Regularity theory or legal positivism. I’ve tried to strike a balance where I know enough surface things about these issues for the purposes of physical law, but do not get lost in career-sized philosophy questions. I will say “I will stop thinking about this now” a few times in this post. Philosophical realism is the claim that things can exist independent of human understanding. Most people today would hold that the physical universe is real in this sense – if all the humans disappeared, the universe would still exist. Two more contentious examples are maths and morals – if there were no people, would there still be infinitely many primes? Would murder still be wrong? An in-depth exploration of realism would be fun but I won’t do it here. Universal theory builds physical laws using objects called universals. These objects exist in reality according to realists, but there is another school called nominalism that argues that universals are a human construct. The problem of whether universals exist in the realist sense stretches back to the Ancient Greeks, and I won’t explore it here. If one rejects realism, then the universal theory falls also. Note that we must describe physical laws using descriptive statements of varying degrees of accuracy. If universals ‘exist’ in the universe, where do they live? The answer, as I understand it, is that universal is instantiated in every particular object that possesses that universal. For example, redness is instantiated in every red object. Every red object therefore possesses the same universal, and all of that universal. ‘being blue or red’ is not an acceptably defined universal, we need to reduce it to the two parts. Say we have two universals, F and G. Then we can go up a level, and talk about a second order universal, a relation between universals. Armstrong calls this relation necessitation, and we can write it as N(F,G). Then the relation between universals is the ‘law,’ and then the consequence of that law is observed in the universe. The left hand statement is about universals, the right hand statement is about a regularity of particular objects in the world. The implication does not go the other way, because there could be a regularity that occurs by coincidence, rather than a regularity that occurs because of a universal. We need to be clear how a relation between universals can generate a relation between particular objects. To do this, note that if we have a first-order relation R (e.g. ‘being next to’) and two particulars a and b, then the combination R(a,b) is a particular (e.g. ‘the fact that a is next to b’). Similarly, the second-order universal N, when applied to the two first-order universals F and G, yields a first-order universal N(F,G). N(F,G), the relation between universals, is therefore itself a universal. It is then instantiated through the form N(F,G)(a’s being F, a’s being G). Regularity theory has difficulty distinguishing between things that happen by coincidence, and things that happen by law. Universal theory automatically solves these problems, by introducing laws that are distinct from regularities. Regularity Theory has problems with counterfactuals – just because all x that we see are y, why should that mean a hypothetical x is also y? The existence of a universal can ensure that the postulated x is also a y by virtue of the universal N(x,y), and so this problem is also solved. Universal theory can also deal with induction. Armstrong argues that the argument ‘All observed x are y -> this unobserved x is y’ is irrational. However, he says that it is rational to adopt the ‘best’ explanation for any observation, and that postulating a general law is the best explanation. Therefore the step ‘All observed x are y -> it is a law that x are y’ is rational. 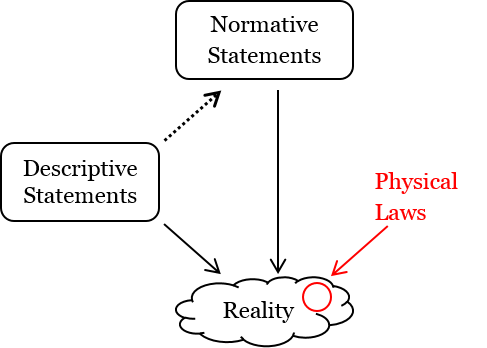 The law can then deductively predict unobserved instances. Therefore universal theory can get around the problem of induction more effectively than regularity theory. Universal theory solves the problems with regularity theory by introducing a new object, the universal. This creates new problems, about the universal itself. One problem with Armstrong’s original Universal Theory, posed by David Lewis, is that Armstrong’s relationship N is not defined. Lewis argues that you can’t just call a relation ‘necessitation’ and have it automatically do what you want. You need to explain why N(F,G) ensures that it is impossible for something to be F without being G. Armstrong later replied to this, deciding that this relation must be causality. The relation N dictates that F causes G.
The left hand side is N(F,G), and we shall call the right hand side R(F,G). Now we want the universe-wide situation that F causes G. We need some higher level object N, to ensure that we have this relation. But this only works if N causes R. To ensure that, we need some higher level object again, N2, which causes the situation that N causes R. But then we need a higher level object again N3 to enable N2 to do what it needs to do. This is an infinite regress, and a vicious infinite regress, in that we can never find the source that answers why F causes G.
This has obvious parallels to Kelsenian law, where each law derives its validity from a higher law, until we hit the Grundnorm. Could an equivalent object be introduced here? I’ll have to think about it. As with Regularity theory, Armstrong does not talk about how to discover the physical laws ‘from the inside.’ He doesn’t deal with things like uncertainty, and how to extrapolate from experience. We can assume (in very fuzzy detail) that a scientist’s job is to posit scientific laws that we hope correspond to physical laws. There could be an analogy here, in that a legal system posits laws that, we hope, correspond to natural laws. Bird, A. (2005). The ultimate argument against Armstrong’s contingent necessitation view of laws. Analysis, 65(2), pp.147-155. Lewis, D. (1983). New work for a theory of universals. Australasian Journal of Philosophy, 61(4), pp.343-377.